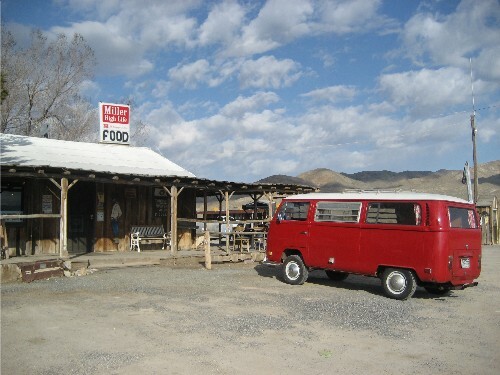 There’s not much life along Nevada’s Highway 50. In 1986, Life magazine dubbed this stretch “The Loneliest Road in America.” My buddy Bill highly recommended that I forego the niceties of I-80 and travel along 50 West from Utah to California instead. Why not? I wasn’t in a hurry. 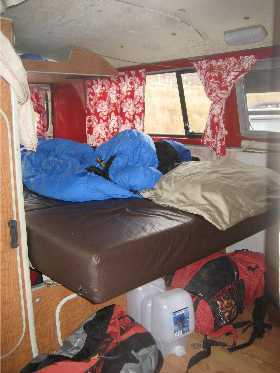 I had my VW van for camping (camp set-up pictured at right). And if anything bad happened…well, I didn’t consider it much, as I don’t think I really knew how desolate this portion of asphalt would be. As it turned out, I drove for long stretches without seeing any other vehicles; cell phone coverage didn’t exist for miles (gasp—the horror! 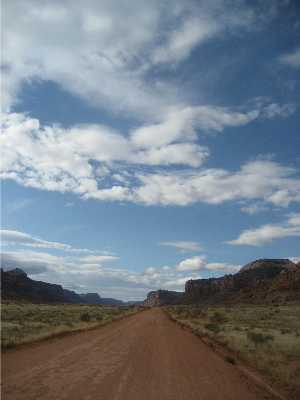 ), and mechanical assistance was way out of reach for most of this journey, should I have needed it. Only a few towns even dot this stretch of road. 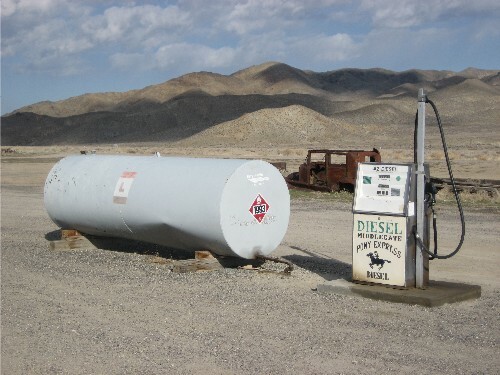 From Fallon, NV to Delta, UT, there are three towns in 409 miles: Austin, Eureka, and Ely. I paid $10 to camp in my van in the parking lot of a Baptist church in Austin, after downing a meatloaf dinner platter (no grocery store to be found). The lady at the diner told me that I might be able to find some breakfast the next morning at a little outpost down the road: Middlegate Station. I found some breakfast inside: powdered donuts and coffee. The place had a roadhouse-kind-of-feel, with a bar and a sizzling grill just waiting to fry up some eggs and bacon. I took my travel mug of coffee outside to get a better look around. 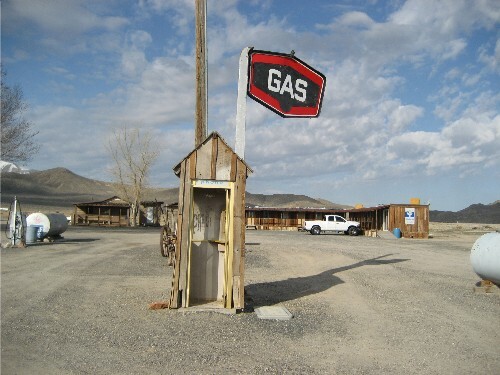 Middlegate Station is definitely a gas station, in addition to a greasy breakfast joint and a bar. And, as far as I know, that pay phone still works. Behind the pay phone is a stretch of hotel rooms…they go for $30 a night, with special trucker rates. 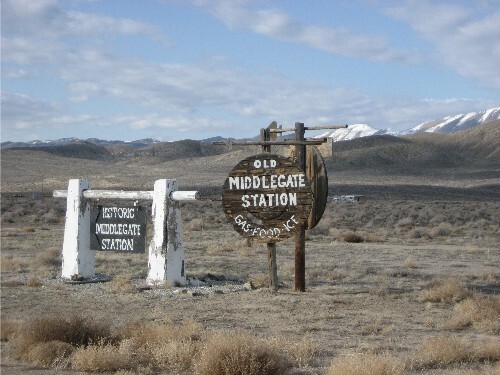 Middlegate Station was once an overland stage station used by the Pony Express, and it remains along the first highway paved coast-to-coast across the U.S. I can’t think of many reasons why a person would want to drive this stretch of road, but Middlegate Station was one of the most curious places I came across on this journey, and if I hadn’t been so grease-logged from the previous night’s meatloaf dinner, I would have stayed longer and had some eggs and bacon (instead of the donuts? Go figure). So far, Laura Bell’s memoir has been the standout in this bunch. Claiming Ground traces Bell’s post-collage move from Kentucky to Wyoming, where she begins herding sheep in the Big Horn Basin. Over the next several decades, Bell works as a cattle rancher, forest ranger, and an outfitter. She’s interesting young woman making her way in this hard world—mostly a man’s world—marked by physical labor and long stretches of solitude. Bell’s descriptions of this vast landscape will awe her readers into reverence for the wide-open, and Bell also brings to her readers a life that most wouldn’t even know how to imagine—the inside of a sheep wagon, for instance, or what it’s like to spot a cow in labor, or what treats best fit in one’s own saddlebags. By anyone’s standards, this book turns out to be a tear-jerker, even though I didn’t expect it to be until I found myself putting on sunglasses to hide the fact that I was openly crying in a café in downtown Salt Lake. Claiming Ground is a beauty of a book, with a quiet emotional current that will rein in any reader’s heart and soul. 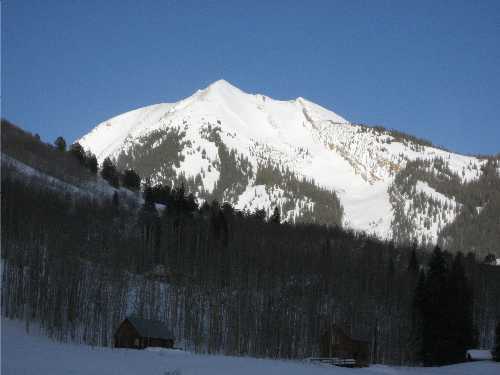 And when you see it, you pretty much decide that this is what you want to climb and ski. So last weekend, Bill, Ralph, Igor, and I set out to do just that. We skinned in through the trees along the ridge at looker’s right in the above photo, dropped down along the saddle in the center, and then did some power-skinning until it was too steep and too wind-crusted to continue. 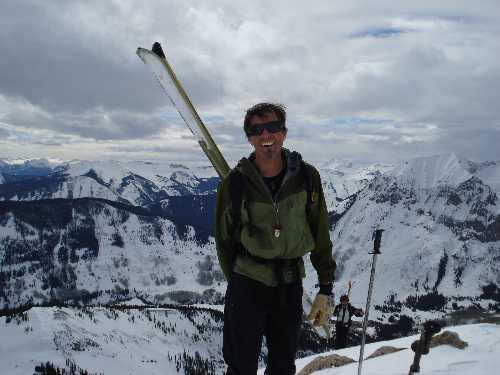 To reach the summit, we skinned and hiked more than 3,000 vertical feet and then skied down some great, varied terrain. It was a warm day, so we were moving along quickly and stopping on occasion (as above) to keep a good layer of wax on our skins to prevent them from balling up with snow. 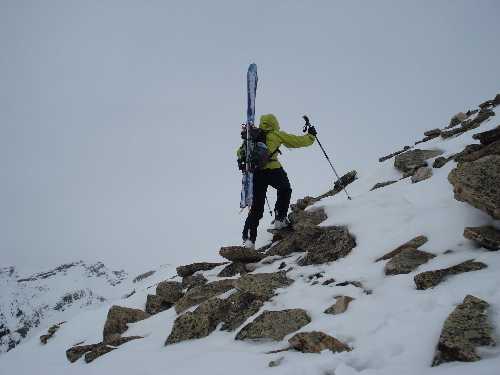 Above tree line, we had to put our skis on our backs and weave our way up a steep, rocky ridge punctuated with some sections of hollow snow that would collapse without notice (me, above…punched through the crust to my hip!). One delicate step at a time over shifty, iced-up boulders had us at the first point on the summit ridge. 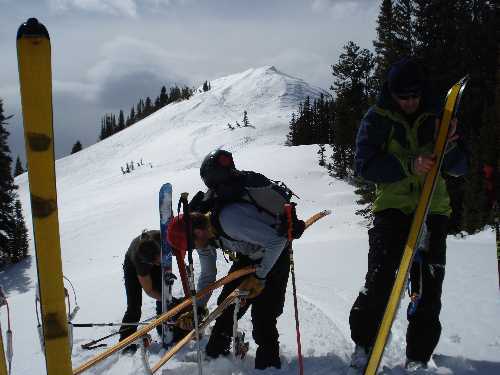 From there, we surveyed the line we wanted to ski. We decided on skiing the face to looker’s left (in top photo, above) of the first point on the summit ridge. And then we hiked to the true summit just to get a good look at our surroundings before skiing back down into the saddle and setting off from there. Bill on top, above, smiling with amazing snowy peaks all around (and Ralph in the background). The skiing from the saddle was steep and solid and nothing you’d want to even consider falling on…so none of us took photos through that section. 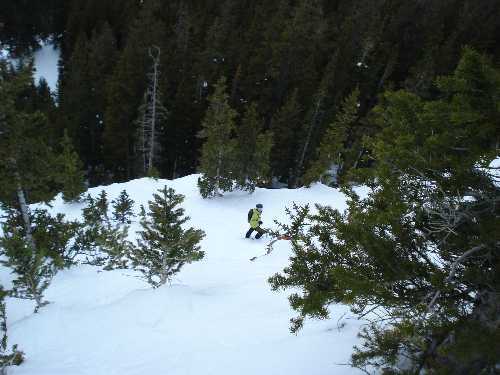 We eventually traversed north to get into the glades, which ended up being some of the steepest, most beautiful snow-filled trees I’ve ever skied. I was smiling ear-to-ear, skiing through these trees…until I suddenly got the feeling that we were in a super sketchy spot. I could see cliffs on both sides of us and a ridiculously steep drop-off below. 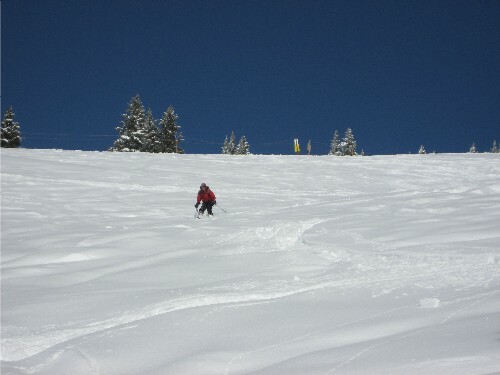 Ralph skied ahead, skirting along the top of the cliff band that we picked our way through. Below the cliff band, the terrain smoothed out, and we cruised through more trees and some gentle rolling terrain until we ran into a stream. Each of us had a different plan for crossing it. Bill and Ralph pony-rode a log that crossed the stream (Bill kept his skis on! ), while I chose to make a few Zen-like steps across some snow-covered stones to reach the other side. The successful stream crossing topped off a super adventurous day. From there, we skied easy terrain back to the front door of the hut, where we cooked some good food and passed the evening hours in the company of some really good friends. After all of this, the view from the hut’s front door became more than that of a beautiful peak. Belleview Mountain’s the place where we cursed and laughed and struggled and climbed and skied our hearts out, together, for a day. Life: Gothic, CO. Population: 4. 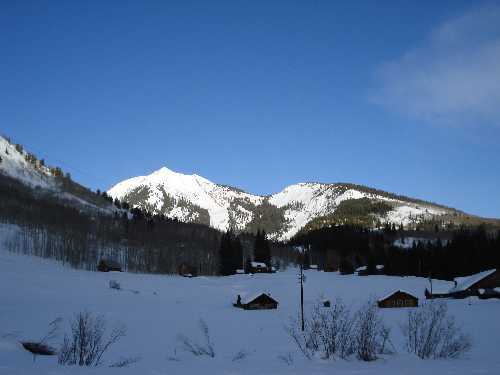 I kicked off the ski-road-trip-vacation last weekend with a hut trip into the town of Gothic, Colorado. Population: 4. That was before our party of fifteen arrived and occupied both the Forest Bell and Maroon huts to celebrate Bill J.’s birthday. 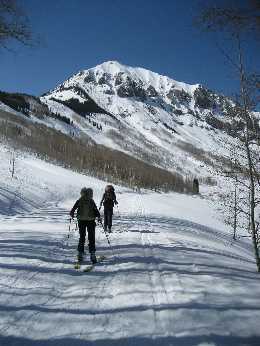 The ski-skin in was a nice, flat three miles from a trailhead just north of Crested Butte. We had perfect weather, and the approach was cruisy enough for people to stock their backpacks with luxury stuffs like booze and…bacon. 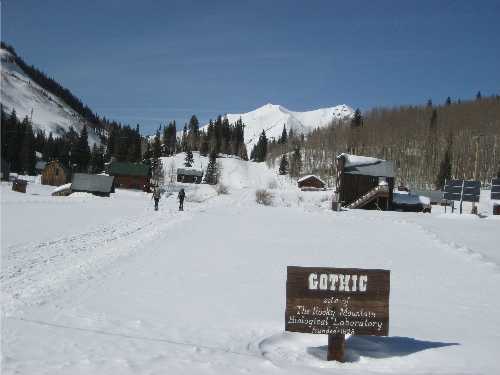 Gothic is a modern-day ghost town of sorts, occupied by only four people—the hut caretakers and a man or two devoted to the town’s current purpose as the site of The Rocky Mountain Biological Laboratory, whatever that is (we were there to ski, no offense). Despite its slight isolation from the rest of reality, I think that Gothic would have probably been a rockin’ place to live in its day, and it wouldn’t be such a bad place in its current state to spend some decent chunks of time. 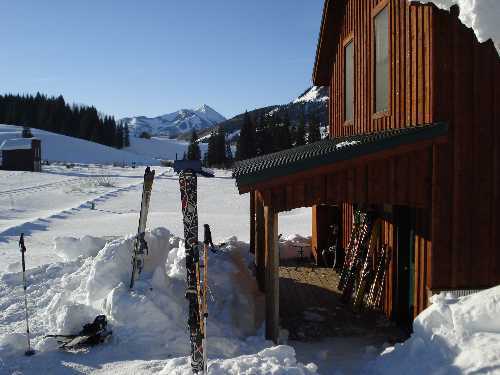 It’s surrounded by near-endless backcountry skiing terrain to explore, and the huts we stayed in were way more cushy than necessary. The Maroon Hut (pictured above), for example, has real mattresses on the beds, running water, a shower (! 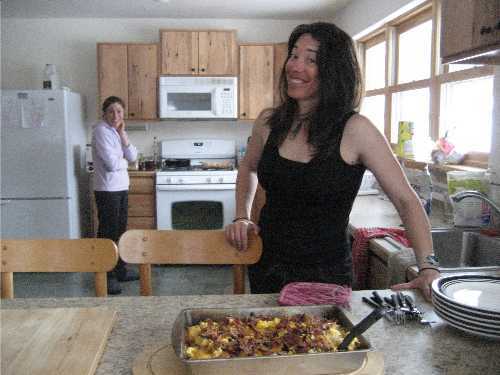 ), and a kitchen stocked with a fridge, a microwave, and a coffee maker. It’s huge, like four times the size of my apartment in Vail. 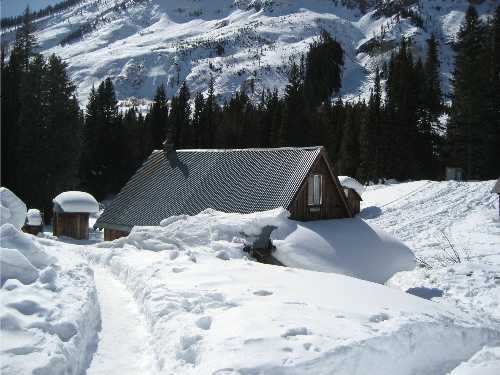 Overkill for a mountain hut experience? Yes. Did we complain? No. 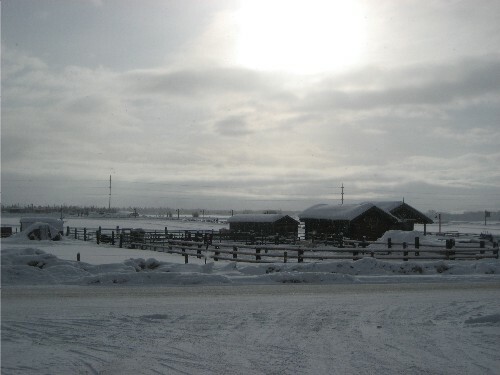 The Forest Queen Hut (above) was a bit more rustic, with a wood-burning stove, and guests at both huts were required to use the outhouse pictured in the background. I didn’t mind the outhouse, which has its name—“Load King”—carved into the wood on its side panel. Nice. 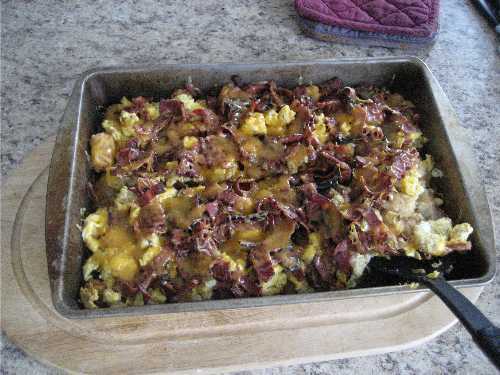 We layered scrambled eggs, bacon, and cheese on top of the toasty tots. This stuff went down like your best greasy drive-thru meal, but it ended up being–no surprise–a big gut bomb. That’s just the start of a very long, beautiful poem. To read more of Walt Whitman’s “Song of the Open Road” on Bartleby.com, click here. Whitman, Walt. Leaves of Grass. Philadelphia: David McKay, [c1900]; Bartleby.com, 1999. www.bartleby.com/142/. [March 17, 2010]. My gal pal Tarrie (at right) and I got out for a little slackcountry skiing last weekend—except that it wasn’t as slack as it could have been, since we put skins on our skis and hiked up 2,800-plus vertical feet on Vail Mountain before dropping out of bounds. 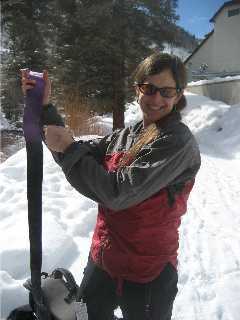 Why didn’t we simply ride the lift up, as most other slackcountry skiers would have done? Well…Tarrie doesn’t have a Vail lift pass, and we thought that skinning for two and a half hours would be less painful than purchasing a $98 lift ticket. And it was, indeed, less painful than that. 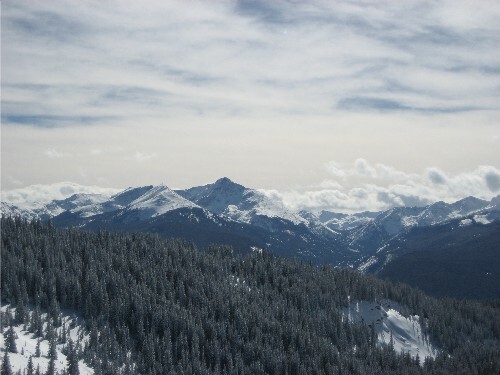 We were lucky enough to have a characteristically Colorado bluebird day, so being on the mountain in those conditions was as it always is: pure bliss. We stopped in the Wildwood café at the top of Chair 3 to get warm and meet up with Sibylle, who—having taken a lift up to meet us—gets the slacker award for the day. We enjoyed views of the Mount of the Holy Cross (below) while we stuffed skins in our packs and headed for the backcountry gate. 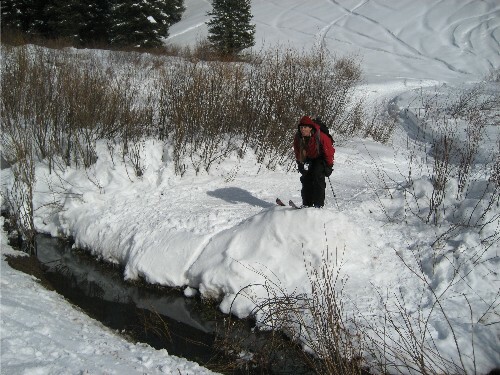 The pond wasn’t entirely covered, so our options were to jump a kicker over some open water…or to weave a way through. I have no shame in admitting that I chose to weave my way through. 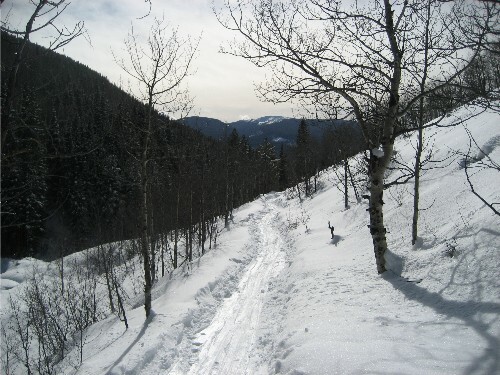 The route takes a sharp left turn at this point and again offers some great rodeo skiing opportunities before the trail dead-ends on a side street at Minturn’s north end. The trailhead happens to be walking distance from the Minturn Saloon, so of course we celebrated a beautiful day out in the mountains over drinks, chips, and salsa. And then we slacked back to the car that we had staged at the trailhead for our return journey to Vail. 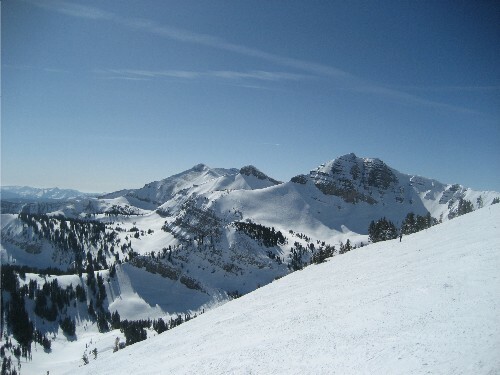 Last week’s Wyoming ski trip, of course, included some skiing at Jackson Hole. I live in Vail, Colorado, so I found Jackson Hole’s lack of crowds and full-length fur coats and cheesy European architecture refreshing. 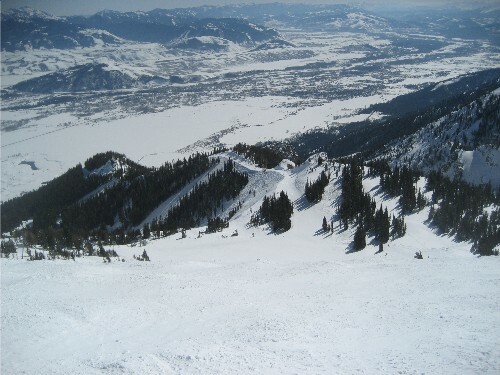 Jackson Hole feels like an American ski experience, which is pretty much what I think people would want when they’re skiing in America, right? I always wonder why there are so many Swiss or German or French or Italian restaurants at American ski resorts. 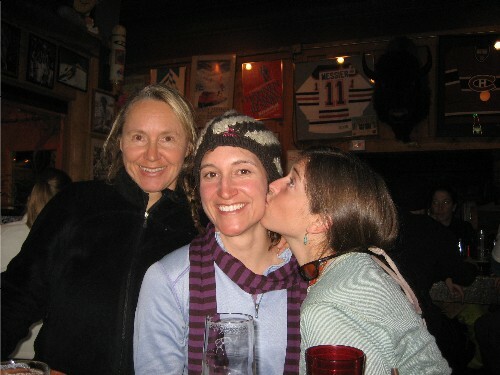 More American ski towns should just go American and have more one-of-a-kind places like Teton Village’s Mangy Moose, you know? Cool local places where you can drink beer and eat burgers and fries. 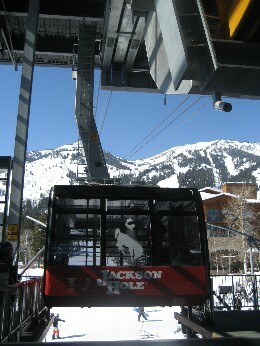 One Euro thing about Jackson Hole that I won’t criticize, however, is The Tram (pictured above, right). 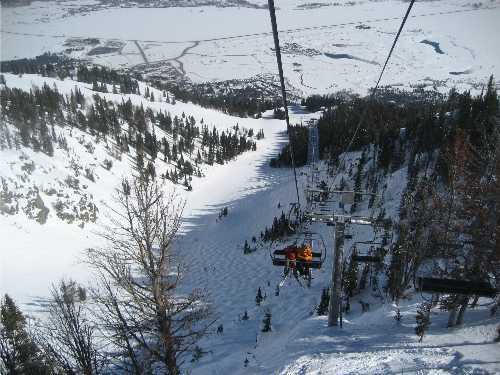 This enclosed lift zooms up to 100 passengers per ride to the top of the mountain, an ear-popping 4000-plus-foot elevation gain in nine minutes. Yee haw! 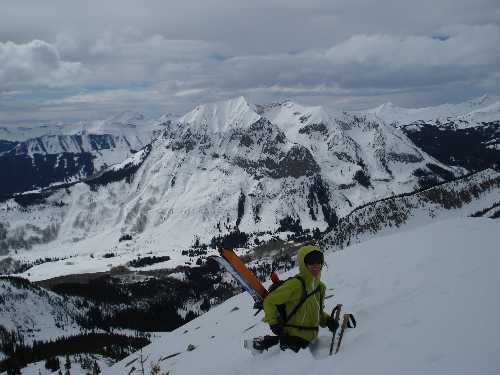 Once you hop off the tram, you just pick where you want to go—in or out of bounds—but simply skiing back down the whole mountain via its ridges and gullies is a 4,000-foot joy in itself (access to the Hoback Ridges pictured above). Due to some pretty cruddy snow on the Sublette and Hoback Ridges, I resorted to running laps on the Sublette Quad, powder sniffing through all of the north-facing trees. 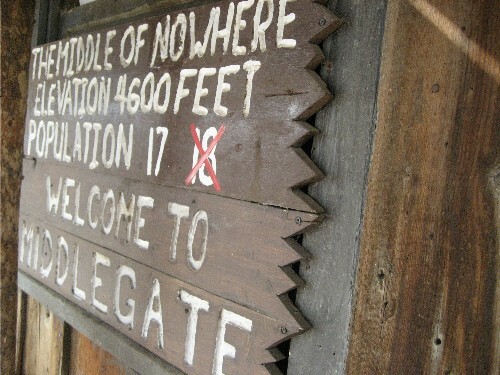 When I was finally convinced that there was none to be found, I regrettably retreated back to the Snake River Lodge. In the meantime, the Big Boys were out skiing lines in the Cody Bowl (pictured above), hiking up the boot pack and then launching off stuff such as Pucker Face, the pretty serious-looking face on the far right of the above photo. Maybe next time for me, right?